This weekend, it's a recital with violinist Maria Bachmann and pianist Jon Klibonoff with Market Square Concerts -- Saturday night at 8pm at Harrisburg's Whitaker Center. On the program, the WORLD PREMIERE of a brand new violin sonata by Philip Glass as well as the G Major Sonata by Maurice Ravel, Enescu's wild Violin Sonata No. 3 "In the Popular Romanian Style," and Johannes Brahms' Violin Sonata No. 3 in D Minor. I've been posting about the program over at the Market Square Concerts Blog. You can read about the World Premiere of Philip Glass's sonata here and the other works on the program here. The York Symphony conducted by Robert Hart Baker (Program 1 Sat/8pm; Program 2 Sun/3pm @ The Strand-Capitol Performing Arts Center) is performing two separate programs this weekend instead of the usual one-night concert. Saturday evening features legendary guest artist Peter Serkin who will be playing two piano concertos - Bach’s D Minor Concerto and Beethoven’s Concerto No. 2 in B-flat; also on the program will be the 1st and 3rd of Bach’s “Brandenburg Concertos.” Sunday’s program will include the rest of the Brandenburg Concertos (Nos. 2, 4, 6 & 5, in that order) featuring members of the orchestra as soloists, joined by harpsichordist Gretchen Dekker for the 5th Concerto. The West Shore Symphony conducted by Timothy Dixon (Sun/3pm @ Carlisle Theater) will be performing the Overture to Glinka’s “Ruslan & Ludmilla,” Mozart’s 3rd Horn Concerto (with soloist Michael Harcrow) and Dvorak’s “New World” Symphony. They’ll be performing a shortened version of this concert suitable for first-time concert-goers and children, Saturday afternoon from 11:15am to noon. The Hershey Symphony conducted by Sandra Dackow (Sat/8pm @ The Hershey Theater) features a program of Mozart and Beethoven: the Overture to Mozart’s “Marriage of Figaro” and his Symphony No. 35 in D (the “Haffner”) and, joined by Stanley Chapaitis, the Violin Concerto by Ludwig van Beethoven. It’s possible there may be others that I’m not following at the moment, so forgive me if I haven’t been entirely inclusive. But that’s certainly enough. As a private citizen, I’ve gotten out of the habit of covering all the music that’s going on in the region but it would’ve been nice to write a good post about each one of these concerts. As for me, I’m hoping to be well-enough-on-the-mend to attend the Harrisburg Symphony Saturday evening. For me, recuperating from surgery a little over two weeks ago to repair a couple of hernias on the verge of celebrating their 2nd anniversary (which in itself is a long story), isn’t going fast enough, though the doctor seemed to think things were moving right along. I managed to over-do it today, I think, though I can hardly imagine what I did that tired me out. Hopefully tomorrow will be a better day. In the past few weeks, then, I haven’t done a lot of blogging, among other things. What time I had that I could muster the concentration and the physical ability to sit long enough was spent trying to finish the last of the pieces for violin and piano. Sitting in a normal chair is still pretty touch-and-go: I have spent too much of my life these past weeks in a recliner, something the Forum is noticeably lacking in with their infamously leg-cramping seats. So this is not going to be the post I would normally prefer to write, an “up-close-and-personal” look at, at least, the unfamiliar work on the program, Schulhoff’s 5th Symphony, and Rachmaninoff’s well-known 3rd Piano Concerto. I’ve known the Rachmaninoff ever since I was a child and my parents bought me the RCA recording with Van Cliburn and Kiril Kondrashin conducting something called the “Symphony of the Air,” Cliburn’s “victory concert”following his return from Russia after winning the Tchaikovsky Competition in 1959. I’d listened to it so much, I can probably still cue the cough 50 years later. Though there may be other, better recordings, this performance still remains one of my favorites. The concerto is a daunting challenge for any artist – Horowitz had once remarked to the composer how hard it was and Rachmaninoff, who premiered the work in New York City a century ago (the second performance was with Gustav Mahler, conducting), claimed he had written it for “elephants” to perform. Rachmaninoff had huge hands – instead of spanning just an octave, he could span an octave and a fifth, the musical equivalent of palming a basketball, I guess. Ironically, he dedicated it to one of his favorite fellow-pianists, Josef Hoffman who couldn’t play it, it turned out, because his hands were too small. This constant stretching for normal-sized hands is one factor that leads to artist fatigue. I don’t know the pianist who’ll be playing it with the Harrisburg Symphony this weekend, Andrew von Oeyen. But you can go to his website and hear his performance of the entire concerto – all three movements of it in three separate clips – with an uncredited (and therefore presumably non-American) orchestra. If only every young artist out getting their career started in their 20s could go on to become someone of the stature of Pinchas Zukerman! But at the time, who’s to know what the future holds? The future was not kind to composer Erwin Schulhoff (pictured at right). He was one of many in a generation of promising composers whose careers were cut short by World War II. His music was declared “degenerate” by the Nazi Regime and because he was Jewish, he was sent to a concentration camp where he died of tuberculosis at the age of 48. He managed to write 6 symphonies (two more never made it beyond piano-score sketches), an opera and a ballet, a great deal of chamber music including three string quartets and three piano sonatas. With all there was to influence a composer at the start of the 20th Century, Schulhoff tried a variety of different styles before he found would might have become his own voice, if he had by the time he was arrested. He studied with Debussy (who died when Schulhoff was 23), was influenced by jazz and the neo-classical style of Stravinsky and the French Les Six. In his “Five Picturesques” of 1919 (written the year after Debussy died) he pre-figured John Cage’s 4'33" by about 33 years. Cage writes a piece in which the pianist sits at the piano for 4 minutes and 33 seconds but never plays a note. The score is blank, a musical expression of Zen calm. Schulhoff’s piece is, however, a frenzy of notation – all rests, often in complex rhythms, no pitches – marked with changes in meter and tempo, the pianist directed to play the rests “with the greatest expression throughout.” And yet Cage is given all the credit. 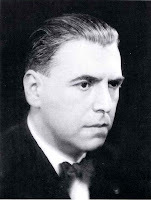 What may have happened to Schulhoff’s musical awareness between 1919 and the year he wrote his 5th Symphony, 1938, I’m not sure since the only piece of his I remember hearing are the Five Pieces for String Quartet which the Cypress Quartet had recorded a few years ago. They’ve been performing them the past few weeks, in fact, and you can see their performance of the Tango from one of their concerts on YouTube. These pieces, written in 1923, shortly after he’d discovered jazz and returned to his hometown of Prague, are delightful dances with a slightly modernist edge that would not be quite as far afield as what Stravinsky was writing in his Post-World-War-I neo-classical style. I also have a recording of two of his song cycles with orchestras – he described them as “symphonies for voice and orchestra” – and though I can’t find a date when they were written (the one, Menschheit, is dedicated to a political activist who was murdered in 1919), they sound very little different from the songs Gustav Mahler had composed two decades earlier, with flashes of Schoenberg’s lushly Romantic Gurrelieder and a wisp of Janacek and even Delius on various occasions. Though the two cycles are published as Op. 26 and 28, it is quite possible they are early pieces published posthumously: I could find nothing about his creative chronology or other works with opus numbers to give it any kind of placement. It would amaze me to think these songs, gorgeous and easy-to-listen-to as they are, could have been written the same year he wrote an absurdist piece that was adamantly nothing but rests! But stranger things have happened in young composers’ lives. By this time, Schulhoff had become a Communist. There is something in this work apparently of the “Socialist Realism” sanctified by the Stalinist regime under which Shostakovich wrote and often chafed. Whether Schulhoff’s 5th Symphony – written the year after Shostakovich completed his 5th – had a specific program or not, no one seems to say, but then there is very little information about the man or his music that survived him. He had planned of emigrating from Czechoslovakia (after the Nazi invasion, he left Prague to live under an assumed name in Brno) and the Soviet Union had approved his passport in 1941, but he was arrested by the Nazis before he could leave. He was deported to a camp in Bavaria where he died of tuberculosis the following year. Given all this, it might also be an extra incentive to attend the pre-concert presentation by Dickinson’s Dr. Amy Wlodarski, who has spoken in the area before on music and the Holocaust. They begin an hour before each performance and I highly recommend coming early for the chance to find out more about the man, his music and the times he lived and died in. There are actually a few items I wanted to post today, none of them congruent enough to make a single post, so here's the first of them, a video of author Elizabeth Gilbert describes her views of creativity, especially following the success of her book "Eat, Pray, Love" - how inspiration works (or doesn't) and how other writers have tried to describe this very indescribable moment in an artist's life - and how an artist deals with the whole problem of continuing to create not only in the face of no success but even after success. Sitting here as I've been these past few days, now, slowly recuperating from minor surgery two weeks ago and trying to get back into the composing mode to finish up the last of the five movements for this Violin Sonata, I have been contending with a considerable lack of inspiration. So it was quite amusing and, in its own way, inspiring, to hear her tell about one of the blacker "pits of despair" she'd experienced while writing her book, when she was thinking not only would it be not just a bad book, it would be, like, the worst book ever, that she spoke to an empty corner of the room as if chastising whatever might have been there, call it "muse" or "spirit" or "inspiration," this thing that can also be the "inner critic" that helps to destroys us in the process, what I call the anti-muse. "Listen, you - thing - uhm, you and I both know that if this book isn't brilliant, that is not entirely my fault, right? 'cause you can see that I am putting everything I have into this, you know, I don't have any more than this... so if you want it to be better, then you've got to show up and do your part of the deal, okay? But if you don't do that, you know what? - the hell with it, I'm going to keep writing anyway, because that's - my - job. And I would please like the record to reflect today that I showed up for my part of the job." That's just one of her comments, something to think about for people who are creative and for those who are curious about people who are creative. (And be cautious of the volume at the beginning, it starts with a blast of loud music). (Courtesy of Joyce DiDonato's blog, Yankee Diva). When "Practicing Practicing Practicing" pays off. You've probably heard some of those stories about performers stepping in at the last moment to sub for an ailing artist - like the one about a young Leonard Bernstein who, after a late night of celebrations following a successful Town Hall recital, found out he was going to make his debut with the New York Philharmonic that afternoon at Carnegie Hall - without rehearsal - and on a radio broadcast? Have you ever wondered what it's like for someone who's going through something like that? Recently, I've found a blog by young tenor Nicholas Phan who, given his Greek-Chinese ancestry, calls his blog Grecchinois. Today's post is one of those stories - waking up feeling not particularly good and being glad it was an uneventful day (beginning with a seemingly uninspiring horoscope, too). Then there was the phone call from his agent wondering if, by any chance, he'd be able to fill in for a possibly ailing tenor in Haydn's "The Creation" if said tenor should become ailing enough to call in sick that evening. Well, he'd sung the part but that was seven years ago, it was in English (this performance would be in German) and it was taking place at Carnegie Hall. While some careers have been made on breaks like this and others haven't -- it's a funny world, being an artist -- it certainly doesn't hurt to have a story like this in your portfolio. It appears the Arts will get their share of the President's Stimulus Package after all: the reconciliation of the House & Senate versions of the package reinstated the $50M originally allotted to the NEA following Senator Tom Coburn's amendment which included language to block any such money going to the arts. You can read the New York Times article here and the Culture Monster's coverage from the Los Angeles Times here. More coverage on the issue -- and the stimulus package in general -- from Matthew Guerrieri at Soho the Dog. Before he wrote an amendment to the Economic Stimulus Package passed the other day by the American Senate, I can’t say I’d ever paid much attention to Senator Tom Coburn. I had to look him up to find out what state he represented – Oklahoma. As a firm believer in the Arts and its impact on our national culture – and I’m not just speaking of “classical music,” here – I do not think much of Sen. Coburn, based on this one issue, politics in general aside. I don’t have the background or the interest to write at length about the delicate balance between Art and Politics. There is much more to the Coburn Amendment than just seeing that no funding finds its way to the Arts Organizations of this country, which may explain why Sen. Schumer of New York failed to understand its potential impact on the Arts in the local economy of New York City. Some of the other details may make sense - except in the context of the past administration's support of, say, the Oil Industry despite their huge profits at a time when average Americans were paying almost $4/gallon at the pump. My primary thought was, “isn’t this a package to stimulate the economy which means to get people out there to create jobs and make money so they can spend it?” The last time I received a “stimulus” from the Bush Administration was a tax rebate that didn’t go toward buying something new: it went into the bank because I had expenses that needed to be paid and a little bit went a little way, those days, toward putting gas in the car, if nothing else. So as a stimulus for the economy, what I did and what many other people likely did with their tax rebates really did nothing for the economy, however it may have helped them individually with more practical issues. Art has been a trickle-down conception for centuries: whether it was funded by support from the Church, the local aristocracy or wealthy individuals who liked to have nice things to show off to their friends, it was rarely the artist who got rich from it all, though it is more likely the artist we remember than the patrons who made it possible. Not all of that art is “Great Art,” despite the overused term “masterpiece” in today’s marketing. But out of millions of artists who created art over the years, only a relative few succeeded into the Arts Hall of Fame, to use another overused marketing ploy. The point is to create a body of work from which the best will “rise to the surface” (call it the “trickle-up theory,” if you want). The assumption is, if there’s less to choose from, there are fewer chosen. Perhaps part of the problem is the national view of Art. Too many people think it is elitist, where rich people go to glitzy theaters throwing “air-kisses” at each other against a backdrop of art that has no relevance to Life As The Rest of Us Know It. Too few people have seen the look of intense involvement on the face of an inner-city youth, listening to a late-Beethoven String Quartet at a free concert. Or watched as a four-year-old toddler stopped his mother so he could stay and listen to some musicians performing live at a local library one Sunday afternoon. Too many people equate popular acclaim with the highest quality – the “American Idol” approach to Art – or feel that only the most popular artists can give you the very best artistic experience. Too few people have seen an amateur group of local actors and musicians perform a complex musical like the original version of Sondheim’s “Sweeney Todd” with all the intensity and skill of the original production I’d seen on Broadway, in many ways better and more convincing than the highly-acclaimed touring roadshow I had also seen when it came to town and left me cold and disappointed and which I would’ve blamed on the show, not the performance, if I hadn’t seen the original cast or had it later redeemed by Harrisburg’s Community Theater. For every Pavarotti, there are dozens, perhaps hundreds of fine tenors out there who could perform just as well and perhaps technically better were it not for that magic spark they lack that somehow earns them the imprint of popular success, whether it’s an artistic spark or a business one. But it has always been that way. Giving more people the “break” to present their art to the public makes it more likely one of those may develop that spark which will lead to success. It’s like one of the arguments against abortion: that fetus could have been born and grown up to be the next Einstein. If money has been cut to a school’s arts program because it was not deemed sufficiently stimulating to the economy, how will we know if that child who didn’t get to hear a concert, go to a play, take a violin lesson, sing Mozart in the choir – how will we ever know what the future has lost? And not just in terms of the artists but of the audience itself? Even getting to compete is a victory of sorts, having the opportunity to get that close. Who can make a career out of the shame of losing a competition? How many winners of competitions can create enough careers to prove we as a nation have a healthy cultural climate? Too many performers’ biographies stress what prestigious competitions they have won. This is not a biography, this is a resume. It tells us nothing of how well they play. But it is important for them to win those competitions because how otherwise do you get peoples’ attentions to be taken seriously? Perhaps one of the problems is that our economy is based not on what we produce but on what we consume. We are more concerned about how much money a film grossed during its first weekend rather than whether or not it was a good film. We determine who gets to watch or listen to what programs on television or radio by what the ratings are and how that translates into advertising dollars for the broadcast companies regardless of their commercial background. Art is something artists produce whether people consume it or not. People who consume art often look for bargains – for a painting over the living room couch: what matters more, what it means to you or what you paid for it? – and artists often don’t make a living wage off their creations the first time around (leave that to agents, resellers, post-consumers). All you have to do is watch a few minutes of PBS’ “Antiques Roadshow” to understand the investment in art consumption. Not every $10 flea-market find is going to end up with a $100,000 re-sale value, but very often we learn something about who we are or what we have through something that may have no intrinsic value beyond our own personal experience. Somewhere, someone created that thing you inherited from Aunt Sally that you had no idea what it was or what to do with it, but yet somebody out there obviously thinks it’s of value. Someone probably created that thing to put food on their table, to help pay a doctor’s bill or put a child through school, to pay the rent. There may be something very real and very relevant in its back-story, regardless of its surface meaning, whether it’s something simply to bring a touch of beauty to a corner of a room or to give you a sense of some deeper connection with your inner soul. Another problem with “The Arts” is that there is no one Art we’re talking about, here. For every type of Art, there are different varieties of appeal and purpose and with that, those who prefer one kind or style over another. People are offended by art that offends someone and if you’re offended by it, therefor it’s not Art. It’s impossible to have a consensus on something that appeals to so wide a constituency. That is why we have political parties in the first place and why “bi-partisanship” is so difficult to obtain, because our systems of values and beliefs are so deeply entrenched, we now see compromise as a sense of failure (“losing the gold”). One party’s view of success is the other party’s recipe for disaster. One political system’s patriotism is another political system’s propaganda. One culture’s religious writings are another culture’s mythology. How can anybody find consensus in something so “cosmopolitan” and universal as Art? Aside from the consumption aspect of Art in our modern economy, there is also the nature of Corporate America, a highly structured neo-feudal organization that can afford to set aside large amounts of money to lobby Congress for its own interests. The Arts are not so organized or “in-your-face” about what they do or why: no Senator is ever going to get as big a campaign contribution from an orchestra as they are from an industrial manufacturer. People who complain about what international stars earn as concert soloists or as conductors of major orchestras as a reason to withhold government funding never seem to be bothered as much by what star athletes are paid by their baseball teams or what CEOs make in their corner fiefdoms. – then the National Endowment for the Arts should be receiving $12.4 Billion, not the $50 Million Senator Coburn is so eager to keep out of the hands of American artists (like his daughter, opera-singer Sarah Coburn). I’m not sure this $50M - 1/13th of what the same bill describes as Costs associated with the Digital Converter Box Program (how does that, by the way, create jobs or stimulate consumer spending?) - needs to go to maestros’ or executive directors’ salaries or to build new palaces for the arts in cities across the land, not that $1M spent in each of the 50 states will really build that many palaces, right? But it could go to programs that would send artists from the community into its schools to introduce young students to the Arts, for example, perhaps not exactly a bottom-line victory for the present (however many jobs it might create for the moment) but one that might be a bottom-line victory for the future, whether it’s in terms of future audience, future contributors and maybe even future artists. It is a stimulus for something now with a long-range result that can still be stimulating for the nation’s cultural health 20-30 years from now. “We need Shoes, not Shakespeare” is an old rant. The trouble is, we need both. But it’s difficult to convince people that Shakespeare will be there to console and inspire us long after the shoes have gone out-of-fashion. P.S. - Here's some more coverage, from a blog about Classical Music on the Radio, Scanning the Dial. The winners of the Grammy Awards were announced today and here are the winners of the Classical Division. (The complete list of Classical Nominees was posted here.) There's live-twittering from this year's Grammys, too, which is where I found them posted after 6pmEST. * Elliott Carter: String Quartets Nos. 1 & 5 - Pacifica Quartet [Naxos] For more on the Pacifica Quartet and their performance of all of Carter's String Quartets, read this post. It'll be making the rounds, so check the composer's website for details, but Central Pennsylvanians can make a road trip out of it for a June performance with the Baltimore Symphony. Here's John Clare's interview with Hilary Hahn over at Sequenza 21 about the up-coming premiere and also about her being a Grammy nominee for her recording of the Schoenberg Violin Concerto (we'll find out who the winners are, tomorrow). By the way, Higdon's String Poetic, a work for violin and piano, is also up for a chamber music Grammy in a recording with violinist Jennifer Koh, for whom she'd already written a concerto for violin, chorus and orchestra last year! Okay now, I'm back to recuperating. Had two hernias repaired on Tuesday and suffice it to say much of my time has been spent in the recliner - the pain has not been much fun; the pain-killers, not enough. Later. So what will be on the program for the Candlemas Concert with the Punxsutawney Philharmonic today? Will the conductor come out of the dressing room and see his shadow? Will they be playing Frank Bridge's symphonic poem, Enter Spring? Or will we get six more weeks of Vivaldi's "Winter" from the Four Seasons? 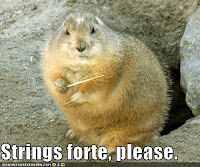 And will the groundhog see his shadow during the final scene from the Greater Punxsutawney Ballet's annual production of The Rite of Spring? Will there be a riot at sunrise today? UPDATE: Punxsutawney Phil, complaining about being unable to sleep with all the partying going on from Steelers fans, has seen his shadow. Octoraro Orphie, from Quarryville, has seen his shadow. And LowPax Louie, the resident rodent in my back yard, sends greetings from Cancun. You would think it was initiated by someone protesting the avant-garde music - shades of the premiere of The Rite of Spring - but no, this was merely (a) an errant cell-phone, (b) a late-arriving drunk, (c) annoyed audience members shooshing the offender(s) and applauding the usher, (d) all of the above. The correct answer seems to be (d). As for cell-phones, with far too many examples to relate here ("yes? what - I'm at a concert - right") , one incident remains firmly planted in the foreground of memory: Bruce Adlophe had come to town for a Market Square Concert performance that included his "analysis" of the opening movement of Mozart's G Minor Piano Quartet which he had deftly turned into a murder trial with his clever narration, frequently imposing suitable text to Mozart's often dramatic music. As the prosecution pressed toward the trial's inevitable outcome, someone's cell-phone went off. It just happened the ringtone was the "Ode to Joy" Theme from Beethoven's 9th Symphony, continuously unfurling while the poor soul tried shutting off the phone. I don't recall how Adolphe ad-libbed from the stage, but it was about a momemt later (and too late) when it occurred to me I should have shouted down from my seat in the mezzanine - to the opening of Beethoven's 5th Symphony - "Ludwig objects! Ludwig objects!" While I have tons of stories from my concert-going days in New York City, back in the '70s - in addition to the one about bean soup and Bruckner at the New York Philharmonic - there is one from a recent Market Square Concerts performance at Harrisburg's Whitaker Center, one that came to mind reading about this Zankel Hall concert. It was a potentially wonderful performance of one of the most mesmerizing of masterpieces, the String Quintet by Franz Schubert with the Miró Quartet joined by the Cleveland Quartet's cellist, Paul Katz, very nearly derailed by... well, let's just call him a late-comer. To describe him as an elderly drunk may be harsh (or a whacko, uncaring), but perhaps “an eccentric gentleman of a certain age” might be more politically correct. The drunkenness can be attested to by people who sat nearer to him than I – one said she could smell it on him as he tottered past her toward a seat near the front. It was as if Peter O'Toole, portraying the hapless deadbeat Peter Plunkett in the 1988 film, High Spirits, had somehow become part of the concert. Unfortunately, he made his entrance only about a minute or so after the Schubert began, well after intermission was over, standing there divesting himself of his raincoat and umbrella before sitting down, waving at a few people and talking to someone nearby. Once he had presumably settled himself, it became apparent he was intimately familiar with Schubert’s quintet, judging from the balletic conducting he proceeded to engage in, sometimes extending his arms to their full length, sometimes up over his head. This went on for the rest of the first movement (which by itself is about 20 minutes long)! Then, as the musicians were preparing to bring us into this most personal inner-world of the second movement, this man began to clap slowly, just four or five times – too late for the first movement and too rhythmic to be applause: I think he was “helping them” set the tempo for the slow movement!! He seemed to calm down once the music began, but was soon moving his hands about as if choreographing the music’s phrasing and changes of mood. I believe this was when he started turning to members of the audience behind and beside him when one young man near him got up and left, coming back after a a brief moment. It was impossible to avoid noticing this even from the front of the mezzanine and I was thinking how it could possibly get worse. The man slowly got up, gathered his raincoat and umbrella, put his arm around the usher and patted him on the shoulder. I cringed thinking he would either make a fuss over being evicted or wave his arm about the hall to apologize to everyone for the inconvenience he may have caused. But he went quietly and, with only a little of the slow movement left, the hall returned to normal – or better, to the world Schubert had intended to create for you, which the musicians were doing such an incredible job recreating for us.